"This is a quick and easy recipe that tastes really good. To add a little more to this soup add one small (7 to 8 ounce) can creamed corn and omit the egg." In a medium stock pot, mix cold chicken broth with cornstarch. Slowly heat over medium heat, stirring frequently. Pour beaten egg into soup, and stir once around stock pot very gently, in order to break up egg. Remove soup from heat immediately, divide into four portions and garnish with green onions. 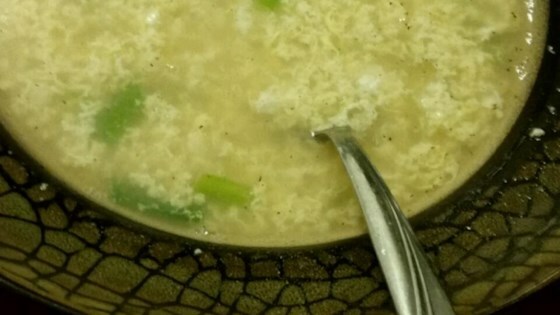 This simple egg drop soup tastes like it came from your favorite restaurant. I had tried another egg drop soup recipe that called for soy sauce and vinegar and I liked this one better. I did double the eggs and green onions. It was soooo awesome and a huge hit!